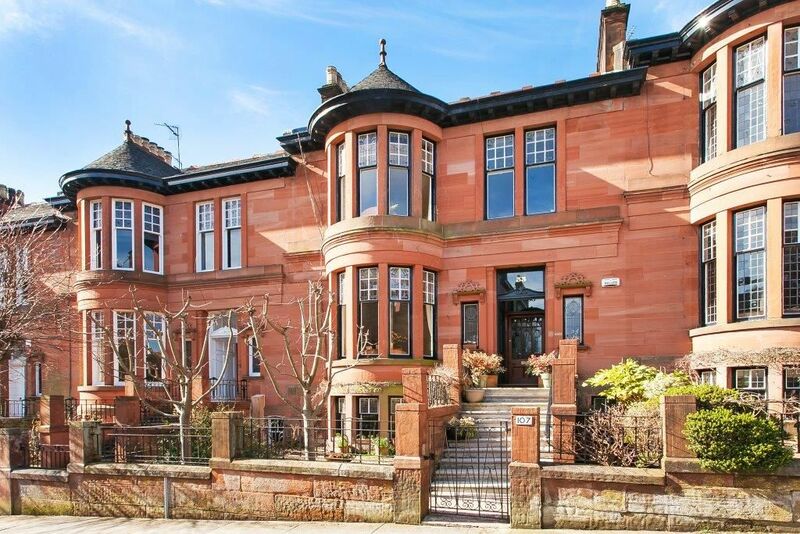 An elegant, private 2 bedroom apartment within the upper part of this Edwardian red sandstone townhouse. Spacious, comfortable accommodation with rooms retaining many original features including stained glass windows, mahogany panelling, wooden floors throughout, lovely etched glass internal skylight, etc. Bedroom one has a superking bed, bay window and fireplace with adjacent full bathroom including shower and bath. Bedroom two has a kingsize bed and an ensuite shower room. Large, bright country style dining kitchen with Aga Cooker and with access to rear patio garden. Private sitting room with comfortable seating, fireplace and original features. This apartment is just a few minutes walk from Glasgow University,The Mackintosh House and all the facilities and attractions of the historic West End of Glasgow. PlusNet internet server with booster for upper rooms. We provide milk, tea and coffee on arrival. Also available are condiments such as salt, pepper, etc. Fully equipped kitchen including dishes for eight. large dining kitchen with AGA cooker. We received a warm welcome from Catherine and George, who had moved us to the upstairs flat as a boiler was being installed in the garden one we had booked, at no extra cost. The apartment allowed us to live in a grand style, in a vibrant, yet quiet part of Glasgow, close to the shops in Byres road , to two stations in the subway and buses in and out of the city. Very close to green oases such as the botanics, and Kelvingrove. Perfect. The apartment is elegantly decorated as well as being very comfortable. The rooms are spacious and we especially liked having a real king size bed. We were able to walk or use the subway to get to everywhere we wanted to go. Grocery stores and restaurants were a short walk away. The owners met us at the apartment and were very patient in explaining how to work the various appliances and showing us where things were located. We would highly recommend this property! This is an architecturally interesting area with many historic listed buildings. Kelvingrove museum, The Mackintosh House, Botanic Gardens, Glasgow University, Hunterian Museum are all within a few minutes walking distance. A short walk away is a thriving shopping area with many restaurants , bars and other venues. Hillhead underground station is approximately 5 mins walk from the apartment.